Alila Ubud is a tranquil hillside retreat that sits high up on the edge of the rich green Ayung River valley in Bali's central foothills. Blending contemporary design and traditional Balinese architecture, the secluded courtyards, spacious terraces and private gardens create an intimate feeling like none other. All rooms offer stunning views of the lush tropical vegetation surrounding the valley. 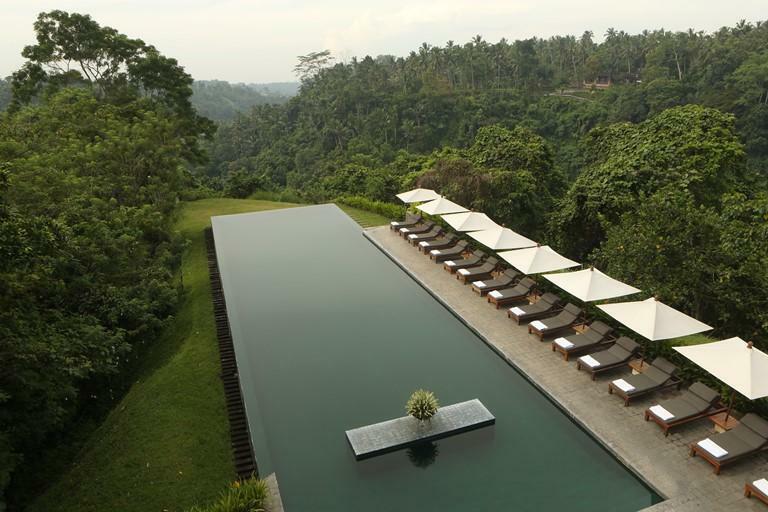 Alila Ubud’s pool has been voted one of the 50 most beautiful pools in the world by Travel and Leisure Magazine. Alila Ubud lies in the traditional Balinese hill village of Payangan, on the banks of the mystical and magical Ayung River. Alila Ubud is just five kilometers from Bali's artistic center of Ubud, a place where artists, writers and musicians from around the world find their inspiration. Here guests can visit a number of art galleries and museums, see dramatic and opulent temple festivals and dances, to take in the magic of the real Bali. The resort's accommodation is designed to resemble a Balinese village. All rooms and villas have panoramic views of the magical Ayung River and surrounding volcanoes. Located on the ground floor of this boutique hotel in Ubud is an intimate hideaway that combines privacy with connection to the outdoors, featuring individual garden terraces and a back courtyard with an open-­‐ air bathroom and shower surrounded by refreshing valley views. Ranging in size from 1344 square feet, the Pool Villas offer an indulgence of space and seclusion in beautiful landscaped gardens with a large private swimming pool, and an open-­air bathtub set in the middle of a lotus pond. A heavenly back to- nature sensation. The villas encompass a spacious bedroom with indoor shower and outdoor bathtub. Assistance with in-­villa arrival and departure included. Located on the upper level of our spa hotel in Ubud and features a private balcony with daybed – the perfect spot to chill out at leisure, laze away the hours with a good book and a cool drink, or simply daydream while enjoying the unobstructed views of the Ayung River Valley. From their beautiful hillside perch on the sunrise side of the resort, the 1291 square feet Terrace Tree Villas invite you to unwind in the lap of nature high above the valley. Enjoy serenity and relaxation out on the spacious wood-­‐decked terrace, surrounded by soothing views of lush plantations and rice paddies on the banks of the valley. Delight in glimpses of Ubud wildlife. Perched over the Ayung River Valley, above the lush green rainforest canopy, each 781 square feet Valley Villa immerses you in an amazing feeling of being on top of the world. Enjoy spectacular valley views from a spacious walk-­‐around deck, and the comforts of a spacious bedroom with indoor shower and outdoor bathtub.Assistance with in-­villa arrival and departure included. The Cabana Lounge an in=mate social space for day=me relaxation, while mood lighting on the two-­story high Karangasem Terracola Brick feature walls inspires an air of sophistication, perfect for enjoying evening cocktails. On the dining front, Chef Erwan brings local, organic garden freshness to a menu that is designed for sharing, and highlights hawker‐style cuisine from around Southeast Asia as well as modern takes on classic poolside fare. Open daily from 10.00am – 11.00pm. Towering coconut pillars and a traditional thatched roof lend a bright and open feel to the brasserie-­‐style restaurant. Our Executive Chef artfully prepares authentic, Asian and seasonal cuisines as well as some of the finest Balinese dishes. Cuisine naturelle from the organic farm is also available. Seating for 48 and 32 on the Terrace. In Room Dining from 7:00 am to 11:00 pm. Alila Ubud is a tranquil hillside retreat that sits high up on the edge of the rich green Ayung River valley in Bali's central foothills. Drive to your destination in Melinggih Kelod, turn left.